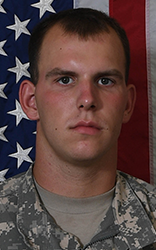 20, of Tyler, Texas, died Oct. 1 in Ninawa Province, Iraq, of injuries sustained when an improved explosive device detonated near his convoy. He was assigned to the 710th Brigade Support Battalion, 3rd Brigade Combat Team, 10th Mountain Division (Light Infantry), Fort Polk, La. The incident is under investigation. WASHINGTON — The Pentagon on Tuesday released the name of the soldier killed Sunday in Iraq. Spc. Alexander Missildine, 20, of Tyler, Texas, was killed when an improvised explosive device exploded near his vehicle on Sunday in Ninawa Province, Iraq, according to a statement from the Defense Department. Missildine was a motor transport operator assigned to the 10th Mountain Division’s 3rd Brigade Combat Team, out of Fort Polk, Louisiana. Missildine joined the Army in 2015. He deployed with his unit in support of Operation Inherent Resolve in September. Missildine is a recipient of the Bronze Star. September was a busy month for Iraqi and coalition forces as the U.S.-led coalition continues to clear ISIS fighters from remaining areas still held by the terrorist group. Following the liberation of Tal Afar, Iraqi forces, backed by U.S. air power, launched a campaign to liberate the town of Hawijah. After only 12 days of fighting, much of the area has been liberated. However, ISIS fighters still dominate parts of Anbar province and the Euphrates river valley.